Santa Claus arrived in style on Monument Square during the 2017 Holiday Horse Parade, pictured in this file photo. In this file photo from the 2017 Holiday Horse Parade, costumed riders on horseback depict the Three Wise Men, a group of scholarly foreigners who traveled to visit Jesus after his birth. The parade travels west on Scioto Street each year before turning back just before reaching the monument and retracing the route east on Scioto Street. A small but festive unit is shown making the turn during last year’s Holiday Horse Parade. Visit Santa this year at his new Santa Land in Oxner’s General Store in Monument Square. 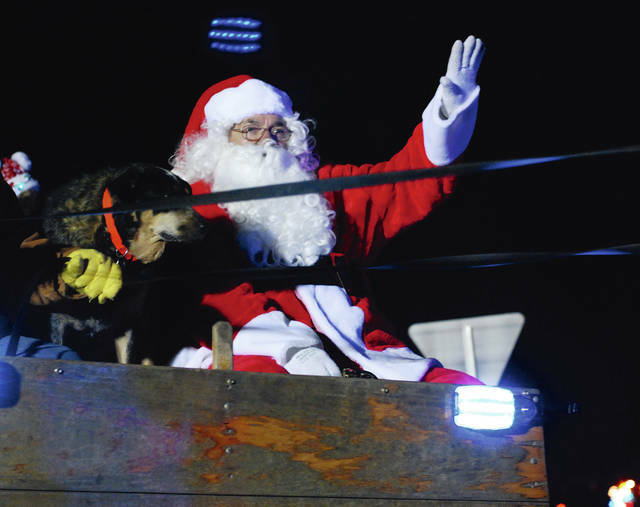 Dozens of decorated horses of all sizes once again will lead Santa Claus down Scioto Street to Urbana’s Santa Land where he will hear the wishes of the young and hopeful. 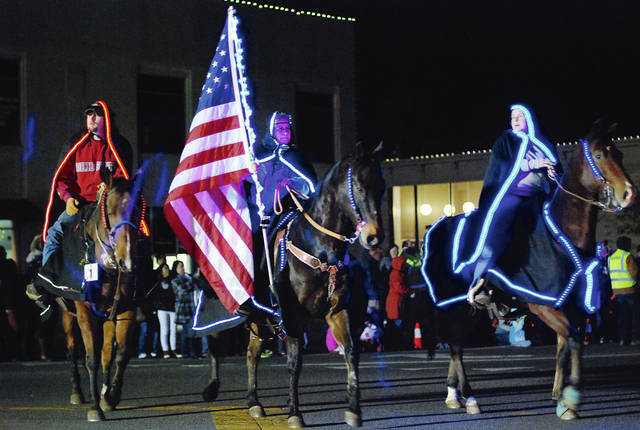 The 4th annual Holiday Horse Parade is scheduled to start at 6:30 p.m. on Friday. “We anticipate 60-plus horses, said Vicki Deere-Bunnell, president of the Monument Square District. MSD, Security National Bank and Peoples Savings Bank are the three major sponsors of the parade, Santa Land and other festive Friday activities. Food vendors and other vendors will start setting up in downtown Urbana at 3 p.m. Friday. Live music starts at 5 p.m.
Free carriage rides also start at 5 p.m., courtesy of the Security and Peoples banks. Hop into the carriages at those two downtown banks. The rides will stop at 6 p.m. and resume after the parade. The 15-foot Christmas tree at Legacy Park, located in the southeast section of Monument Square, will shine bright starting with the 5:30 p.m. Tree Lighting Ceremony. At about this time, Security National Bank will begin offering complimentary hot chocolate and coffee, and Peoples Savings Bank will offer complimentary cookies. At 6 p.m., traffic will be stopped on Scioto Street from Patrick Avenue to Monument Square, and side streets will be blocked. There is to be no parking on Scioto Street or around the Square. The CVS Pharmacy parking lot will be the staging area for the parade. The dozens of horses will be decorated with lights, bells and other holiday fare before jingling their way down Scioto Street from Patrick Avenue to Monument Square, where Santa will alight from his trolley and head to his new Santa Land at Oxner’s General Store, 15 Monument Square. The horses will not go around the Square, but instead will turn around just east of the monument and return to the CVS parking lot. “They do this because they love it,” Deere-Bunnell said of the horse owners and caretakers. As a thank-you, horses will be offered peppermint treats to nibble, and their human companions will receive gift bags from local merchants. Scioto Street residents are encouraged to brighten Scioto Street with lights and decorations for the parade, Deere-Bunnell said. Judges will rate residences from East Lawn Avenue to the Square in a house-lighting competition, with the winner receiving gifts from downtown merchants. Once Santa reaches Santa Land in Oxner’s General Store after the parade, children can tell him their wishes until 9:30 p.m. Friday. Fifty children will be chosen that night to attend a Breakfast With Santa on Dec. 2 in the county Community Center. Names of children can be entered in a drawing in which two children will receive free bikes, courtesy of White’s Ford. Letters to Santa will be welcome at Legacy Park in the southeast section of Monument Square and at the Daily Citizen in the Kroger shopping plaza until 5 p.m. Dec. 18. Just drop letters into Santa’s mailbox in Legacy Park or visit the UDC during business hours: 9 a.m.-5 p.m. weekdays (closing at 3 p.m. today and at noon Friday, Nov. 23). Letters will be published in the Dec. 24 edition of the UDC. Nov. 30 from 5 to 8 p.m.
Dec. 1 from 11 a.m. to 2 p.m.
Dec. 7 from 5 to 8 p.m.
Dec. 8 from 11 a.m. to 2 p.m.
Dec. 14 from 5 to 8 p.m.
Dec. 15 from 11 a.m. to 2 p.m.
Dec. 21 from 5 to 8 p.m.
Dec. 22 from 11 a.m. to 2 p.m.
Kathy Fox can be reached at 937-652-1331, ext. 1773.